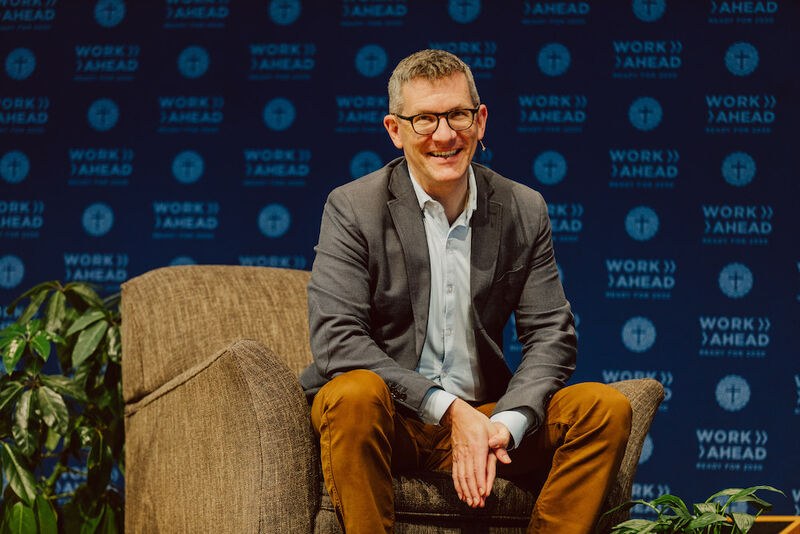 This morning, executives from leading coffee and chocolate companies (“anything that you’ve given up for Lent, probably these two people are involved in producing,” joked moderator Andy Crouch, partner for theology and culture at Praxis) led a candid conversation about the future of work at a kickoff event for Gordon College’s new yearlong Work Ahead: Ready for 2030 initiative. They talked about technology, yes, but they talked an equal amount about love. “Being yourself and loving your audience is really how to run a company,” said Starbucks Chairman Mike Ullman, who has led five major enterprises on three continents. As Ullman and West shared insight on what “forward” might entail, they brought wisdom from their own career challenges and achievements. For Ullman, leading J. C. Penney through its cultural turnaround began by taking a critical look at the way its 1,100 stores were operating under what he called a “cookie cutter” model, with managers mainly focused on bonuses. In that moment, West realized the importance of having the right people in her life and in her workplace. “What does the company stand for and how does the company purpose align with the individual’s purpose?” she asked. “I do think [technology] will fundamentally change jobs and the type of jobs. That doesn’t mean jobs go away. It means we free up people to do work, different kinds of work,” she continued. For West, technology brings freedom and possibilities to the workplace, and a mandate to remain open. She encouraged students in the audience to ask, “How do I think about what I’m doing and what modern technology offers, and how do I match that up into something I want to spend my time doing every day? “It’s not a question of what somebody else has; it’s what can you do,” said Ullman. 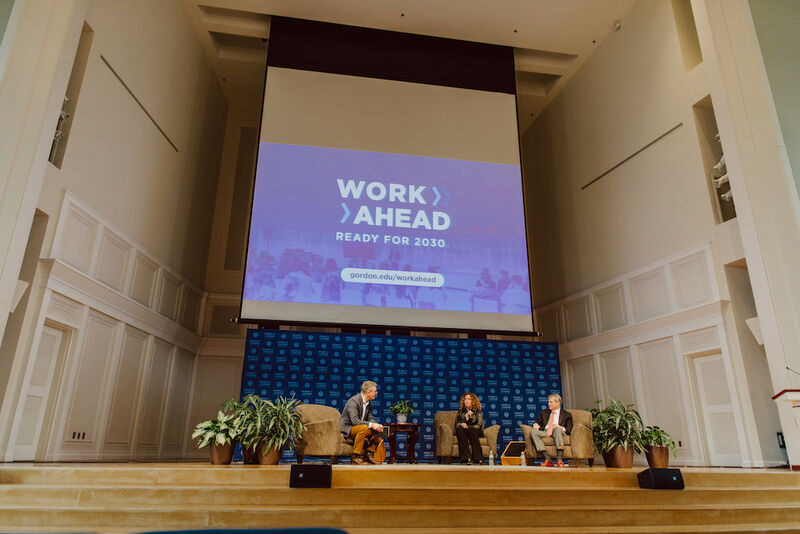 Ullman, West and Crouch are three of the more than a dozen relevant thought leaders contributing to Gordon’s Colleges Work Ahead: Ready for 2030 initiative, which will prepare liberal arts students for the future of work. First-year students will be 30 years old in 2030, and by some estimates, more than two-thirds of them will work in careers and roles that don’t exist today. 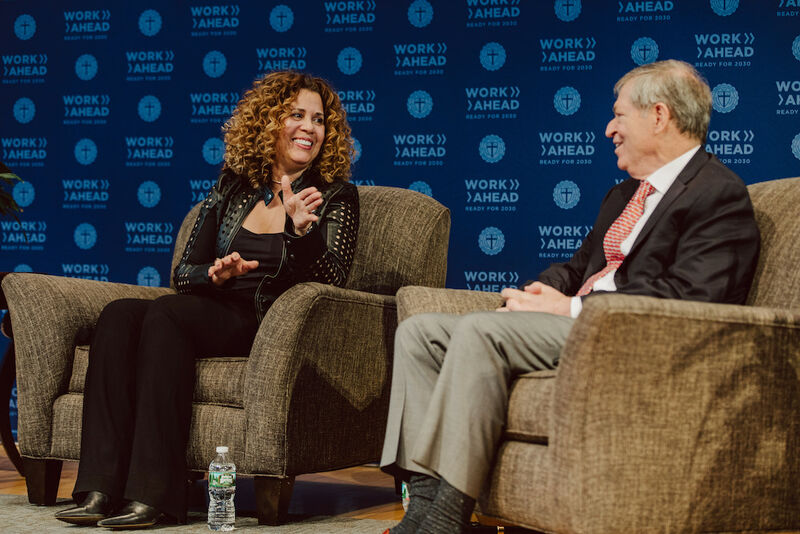 Work Ahead will offer direction as to what knowledge, skills and aptitudes are needed in order for these students to thrive in future workplaces. The next Work Ahead event will take place during Homecoming and Family Weekend, which is happening October 4 and 5, 2019.